Håfa adai and aloha todus hamyo! As a Chamoru, Pacific islander, and Oceanian living in a Western world, my culture and values are challenged every day. My value of mangåffa’, belonging, and the past are almost completely opposite of those of American culture, or lack thereof. By beginning again and starting completely from scratch, it was easy to temporarily forget i hale’-hu (my roots). I thought I uprooted myself, but I didn’t truly realize how deep i hale’-hu actually go. I’ve been growing håle’ in i Islas Marianas for thousands of years, so no amount of distance or time could cut them. Using my culture as a lens or way to see things, I try to observe society’s current realities. My current reality is that I live in a politically and economically Western place that is also a geographically and culturally Oceanic/Pacific island at its core. This goes for Hawai’i and Guåhan: we both have the U.S. flag flying over our lands (without choice or desire) but our cultures are in the roots of them. Although I have always seen it and somewhat knew it, I have finally come to understand that Western cultures value innovation, moving forward, and the future. They see time as a line: the future ahead of them and the past behind them. They turn their backs on the past and charge the future head on with full-force. They forget the rich knowledge gained by the people before them, therefore end up making the same mistakes. The newly elected president Donald Trump is the prime example. Growing up in a bi-cultural environment with Western surrounding me but Chamoru inside of me, I was somewhat a recipient of this mindset and way to approach life. I turned my back to the past and all the lessons it holds, and forgot that those lessons could guide me through the future. I always chose to learn the hard way and make my own mistakes even though someone I love and trust has literally been there and done that. Yes, I learned a lot from my experiences, but looking back now, I wasted so much time learning the hard way, and suffering because of it when I could’ve easily listened to my family, learned through their experiences, and learned something new and less painful. But hey, you live and you learn. Micronesians, Melanesians, and Polynesians all view time as cyclical. Life is a natural cycle that we are very in-tune with (or used to be): the sun rises and sets, the tide comes and goes, i fufu’ mångga (the mango tree) gives you mangoes then leaves you waiting anxiously for next mango season. In the words of my kumu/fafa’någue (Hawaiian/Chamoru for teacher), “history repeats itself every day.” By knowing history, we can make sure we don’t repeat the same mistakes as our ancestors. There is so much to learn from the past that will teach us how to overcome our present problems. When you know your roots, you can grow. No, you don’t have to learn the entire history of your people unless you really want to, then you should. I actually highly recommend you to try! A good start is knowing your family history: ask your grandparents about when they grew up and what home was like, ask your dad the hardest decision he’s ever made, see how far back you can trace your genealogy. In knowing these things and the struggles that our own blood and spirits have overcome will inspire us and give us strength to overcome our own. Now put that in today’s context and replace “the Spanish” with “the American government”. Everything still applies because history repeats itself.Although this was a great feat, Maga’låhi Hurao and his men failed three times. Failing three times followed by a typhoon says a lot about the situation. What we can learn from this is that we can’t decolonize ourselves with only 2,000 warriors, we need the entire island in this battle. We can learn that this doesn’t have to be a gory battle, but a well-coordinated transition. Instead of resorting to war, violence, and weapons, we can use peace, love, and education to regain the freedom given to us by our ancestors. Hurao was right though, we are stronger than we think. Marcus Garvey said, “A people without the knowledge of their past history, origin and culture is like a tree without roots.” Realize and learn how you got here, who helped you, and why you are here. Plant your feet firmly and deeply in your land and strengthen that connection. Look forward to the past to be guided through the unknown future. Tungo i hale’-mu. Grow. Si Yu’us ma’åse pot i tinaitai-miyu. Now that the Festival of Pacific Arts and Cultures is long over and the fever is long gone, I felt now is a good time to reflect upon the historic, once-in-a-lifetime event that can change the course of our cultural and colonial history. Guåhan hosted the 12th quadrennial FESTPAC in which twenty-seven island nations– independent and colonized came together to share their stories and cultures through dance, song, sailing, tattooing, weaving, film, healing, and various mediums of ancient and contemporary art. It truly was the “olympics of Pacific cultures”. Many might agree that it wasn’t well-planned, organized, and funded, however everything flowed and came together by the hard-working hands of all the delegates and our people. I know everyone enjoyed it and misses it now that it’s over. Thousands of locals came to watch the opening ceremony, and almost everyone showed pride in where they’re from– Chamorus wore their sinahis, tapon (spondylous), and repped their beloved Guåhan brands. Chuukese, Belauans, Pohnpeians, and other islanders wore their native-wear proudly. Being submerged in the ocean of Pacific cultures encouraged us to embrace the islanders in us and rejoice our uniqueness and likenesses. In those two weeks, we started to feel free to express ourselves, explore our cultures, learn our pasts, face our presents, and navigate our futures. FESTPAC was a great experience for Chamorus especially to reconnect with our inner islanders and neighbor islanders because we aren’t so connected to our culture. Many of us don’t speak our language or remember our ancient arts; most are modern interpretations of what we believe our ancestors did. That sacred knowledge and stories were stolen from us by brainwashing, assimilating colonizers. In one of the demonstrations at Saggan Kotturan Chamoru, Solomon Islanders made spondylous beads using all-natural, hand-made tools– an ancient art passed down by their ancestors. They made me wonder how my ancestors made their tapon and feel disheartened that I don’t know. However, instead of mourning what we lost in the past 4,500 years, I focused on how we came together, with 26 other island nations miles and histories apart to celebrate håfa iyo-ta, håfa guinåha-ta, yan håfa ta påtte (what is ours, what we have, and what we share). Maybe our ancestors made their tapon the same way the Solomons did– we are kind of related. On the contrary, one issue few islands share with Guahan is a colonial status. Colonization has been an issue for too long especially in the Pacific, however the uproar of appreciation and pride for our cultures raised awareness on it. The Guåhan delegation ended the closing ceremony with a giant banner reading, “DECOLONIZE OCEANIA, FREE GUAHAN.” Now that we’re learning and loving what makes us unique, we must protect our cultures and languages from outside forces. Colonizers don’t know or understand our cultures and lands, so they don’t know what it takes to resolve our problems and take care of our peoples. Whatever they do with their colonial subjects is for their benefit only. As long as someone else’s flag is flying over our lands, our futures aren’t in our hands. We must reunite our communities with all our strength and voices to end colonization. FESTPAC ignited flames of interest, passion, and respect for all cultures, but now that it’s over, we must keep the fires going. Don’t let pride in your culture stop at clothing and jewelry, dig deeper: unearth your history, make your language live on, explore and protect your homelands, and wear your island-skin every day. Saina ma’åse nu i tinaitai-miyu. Guam needs change. Guam is currently one of the last 16 colonized, non-self-governing nations with the longest colonial history in the world. Guam was colonized by Spain in the 1600s then given to the U.S. in 1898 as a spoil of the Spanish-American war. Although the native people of Guam, the Chamorus were forced to stop speaking their language, forced to convert from their indigenous spiritual practices to Christianity, forced out of their own land, suffered genocide in the Chamoru-Spanish War, and held as second-class citizens in their own home, they have remained resilient and managed to keep much of the culture and language alive. Guam’s current political status is “unincorporated territory” of the United States of America, meaning that it is a possession of the U.S. that has limited self-government and is at the disposal of the U.S. According to Guampedia, the people of Guam are US Citizens and while they may acquire full political equality as individuals, if they move to any of the fifty states, they are in a subservient political condition if they remain on Guam. They are unable to vote for president, select members of US Congress with voting power and congress can overturn any law passed in Guam and decide which parts of the US Constitution apply to it” (Underwood 2014). Guam has no voting delegate in Congress or seat in the United Nations. This has and is still affecting our island’s infrastructure, culture, resources, and people in mostly negative ways. As an unincorporated territory, Guam is unable to manage immigration suitable for the island, therefore our infrastructure is not up to par for the amount of residents and visitors. Under the U.S. Department of Education and economy, Guam has become more “Americanized” with little to no Chamoru culture and language taught in schools and no use for Chamoru in everyday life. Guam is also dependent on the U.S. federal government monetarily, using thousands of federal dollars each fiscal year for programs such as food stamps, welfare, and even our tax refunds to name a few. As an unincorporated territory of the U.S., the federal government can take whatever land they want and is currently controlling one third of Guam’s landmass, not properly taking care of the resources within. Guam’s government and citizens have limited freedoms due to its political status which may be changed through decolonization. Decolonization is the freeing of a colony to become self-governing or independent. In order for the indigenous Chamoru people of Guam and the migrated people who call Guam home to decolonize themselves, they must undergo the process of self-determination. Self-determination is the process in which the people of a colonial territory express their desire for a self-governing status. The people of Guam have three options of self-government: statehood, free association, and independence. If permitted by the U.S., in statehood, Guam will become the 51st (fifty-first) state of the United States of America in which residents abide to the laws and receive constitutional rights. Free association is in essence a bargain through which a degree of external sovereignty is freely exchanged in return for a defense commitment and the promise of significant economic assistance. Independence is becoming a sovereign nation. 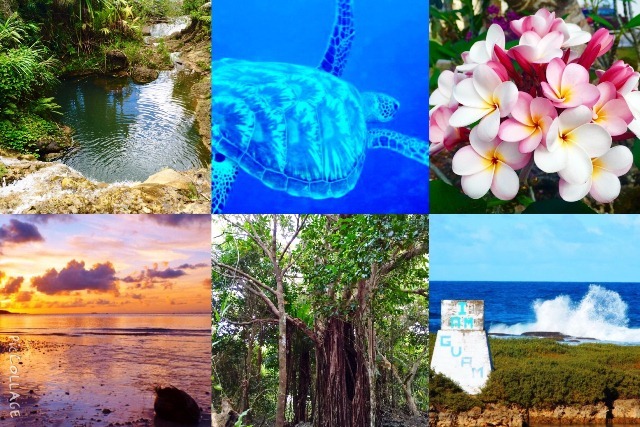 Each status will affect Guam’s land and resources, the residents’ rights, immigration, culture, legal system, education, and foreign affairs. Each status has its pros and cons, however, I believe that independence is the best status option for Guam. According to the Independence for Guam Task Force of the Guam Commission on Decolonization, “Independence is a chance for the people of Guam to truly determine our own destiny. For many centuries, Guam’s political course has been dictated for us—our people, our land, and our resources have been used to benefit other countries leaving us at a greater loss each time. Currently, Guam is stuck with a dependent and underdeveloped relationship with the United States. The colonial status of Guam keeps us trapped – economically, politically, mentally, and spiritually. Independence will allow us to work together as a community to grow into a more sustainable and regionally integrated people, who will no longer be stunted as a colony of the United States” (Hafa Ilek-mu Self-Determination, n.d.). The native and indigenous people of Guam should declare independence from the United States government because of its dictatorial history, to protect the Chamoru culture and language, and to manage the resources to sustain themselves and future generations. The United States government has expressed no interest in the wellbeing of the Chamoru people and the perpetuation and protection of the Chamoru culture many times throughout their colonialism on Guam. As stated earlier, Guam was purchased by the U.S. in the Treaty of Paris in 1898 as a spoil of the Spanish-American War. The U.S. bought Guam, the Phillippines, and all inhabitants as if they were animals and not human beings. Following the Treaty of Paris, the Navy assumed the position of the government of Guam. According to one of the first appointed Naval governors Governor Dyer, the Chamorus were to be Americanized and, “…taught, at once, to help themselves in ways to make themselves useful to us . . .”. After Guam was seized by Japan in WWII, the military leveled the island with thousands of pounds of explosives regardless of the presence of the local people. The U.S. then reclaimed Guam in 1944 and seized one third of the island’s landmass without adequate compensation, leaving many Chamorus homeless and poor. According to my grandmother Engracia Pangelinan, WWII survivor, the schools established by the Navy discouraged the use of the Chamoru language and forced English upon them in hopes of Americanizing the Chamorus. The Chamoru people resented the way the government treated them and sought for a fair government and civil rights. They believed that becoming U.S. citizens would give them U.S. civil rights and fought for such. They were granted citizenship in the Organic Act of 1950 which was modeled after the U.S. Constitution, but were not granted all the constitutional rights including the right to vote for President. There have been many efforts by the Chamoru people to decolonize themselves, but due to the lack of support from the federal government and education amongst Chamorus, they have failed. Today, the U.S. still owns one third of Guam’s landmass and is continuing to take more. They have recently finalized the taking of Litekyan- a wildlife reserve, ancient village, and sacred place to the Chamoru people to be used as a firing range. The U.S. plans on taking more for the highly anticipated military buildup- the relocation of thousands of marines and their dependents to Guam. Some say the buildup will be good for Guam, but many native Chamorus feel that it will be further detrimental to the land, culture, language, and survival of the Chamoru people in their own home. Choosing independence for Guam will better allow the preservation and perpetuation of the Chamoru culture and language. Guam’s educational system is and has always been parallel to that of the United States, in which students learn the same things as students in the continental U.S., and are compared to American standards and statistics. My father Rick Nauta, whom does not speak Chamoru but has Chamoru-speaking parents asked his mother why she did not teach him Chamoru. She said that she did not want it to affect his English and how well he did in school. As one can see, the U.S. has affectively devalued the importance of the Chamoru culture and language in Chamorus themselves. Today, there are few courses in high school that teach Chamoru language, dance, history, and practices, however in my experience, they seemed underfunded and unimportant to the education of a Guam student as a whole. Public elementary students are only allotted 20 minutes each day for learning Chamoru. What can possibly taught, learned, and comprehended in 20 minutes? The perpetuation of the culture is obviously not a priority for the Department of Education, so if our culture and language is not taught, it will die. In Decolonization Through the Self-Determination of a People- An Overview of Guam’s Status and Options by the Guam Commission on Decolonization, independence will engender the “continuation of existing standards with large resource allocation directed to long-term residents… the local school system empowered to develop locally/regionally relevant curriculum”. As an independent nation, not only will Guam be able to implement Chamoru values and language into the curriculum, but teach the curriculum in Chamoru. In An Analysis of the Economic Impact of Guam’s Political Status Options by Joseph Bradley, “it is anticipated that there will be a resurgence in the Chamorro language and culture in the independent nation of Guam. There is even the remote possibility that the use of the Chamorro language will be mandated for some of the island’s governmental activities”. As an independent nation, Guam will regain access to all of its natural resources and manage them according to the needs of the people. As a small island with only 212 square miles of land, Guam is limited in resources including soil for agriculture and freshwater sources. The federal government currently owns land that has many resources including but not limited to the Mt. Santa Rosa Reservoir, Agana Springs, Tarague Natural Wells, the Tumon Bay Recreational area, and the Fena River Reservoir, totaling in over 43,000 acres. That land was taken from many Chamoru families whom were inadequately compensated, including my maternal grandmother Engracia Pangelinan. The military exploits the resources in those lands to benefit themselves and even sells the products back to the government of Guam. They do not properly care for the land as seen in their ownership of Tiyan. The military claimed it after the war, dumped biohazardous waste on it, and gave it back to the government when it was deemed toxic and inhabitable. There are actually 95 toxic sites on Guam alone, many results of mistreatment and disrespect. As an independent nation, Chamoru property rights will come first and local law will be redefined to accommodate local conditions and economic development. As an independent nation, Guam will also be able to control immigration and the use of public land to better stabilize infrastructure (Guam Commission on Decolonization, n.d.). All 43,000+ acres of land under the military’s control will be distributed back to their rightful owners, and the rest could be used for agricultural development or economic enhancement. Many people believe that Guam is not ready for independence, however the longer we spend preparing and planning, the more land is taken away, the more our culture and language die, and the more our island becomes a big military base. It is going to be a drastic and difficult change, but it is possible. For guidance and reassurance, we can look to our sister island of Palau. With education of its people, government involvement, self-determination, and great effort, they have become their own sovereign nation where their culture and language thrive, their resources are loved and taken care of, and their people are interdependent on each other and their land. If Palau can do it, Guam can do it too. We must educate ourselves, join hand in hand, and vote for our right to be our own nation. “The foundation of Guåhan is the Chamoru culture in all its expressions. The ancients arrived thousands of years ago. The future generations will continue this journey in search of the expression of the human experience.” –Anthony J Ramirez. Guåhan is tano i man Chamoru—the land of the Chamoru people, and we should keep it that way. Together we can change our status from in dependence to independent. Si Yu’us Ma’ase for reading. “Håfa adai!” is the most renowned Chamoru greeting in all of the Marianas. It’s a spirit of warmth, hospitality, and love, residing in the hearts of all those who perpetuate it. It’s an icon of the Chamoru culture, illustrated on many hats and shirts of local brands. Many Chamorus and Guamanians alike are bringing this Chamoru greeting back to life by using in their everyday lives. Even local companies have taken the “Håfa Adai Pledge” in which they swear to greet everyone with håfa adai. It’s awesome and a great step for our people towards the revival of our culture. “Håfa adai”, to me has always been a simple Chamoru greeting, until recently when my uncle Tony Ramirez, accomplished Guåhan historian and my mother Rita Nauta, co-founder of guampedia.com shed light on the true meaning and depth of those words. I mañaina-hu said that håfa adai is actually short for håfa un adadahi hao meaning, “how are you caring for yourself”. In that moment, it all came together… Our culture teaches that we are supposed to treat everyone like they’re family, so showing love and care for someone, even a complete stranger is (supposed to be) our initial response to assoda (meeting) them… like second nature. Knowing the meaning of håfa adai is only half the job; the other half is to perpetuate the beliefs, practices, and values that are in the meaning itself. Like si nanå-hu said, in our culture, we practice universal love–loving everyone selflessly. Doing this, however, has become quite difficult with Western influence and what the Westerners did with our hospitality. Western ideals and culture are much more individualistic, which clash with our collectivistic Chamoru values. It’s also hard to be welcoming and caring for everyone because as a people, we are scarred. We were so grateful to Uncle Sam for saving us from the Japanese in World War II, but what they did and are doing to us now is beyond chenchule’. They’ve taken our land without adequate compensation; made us second-class citizens on our own island; seized ancestral, spiritual lands; denied us access to those lands; and infected our culture. A great step in the direction of cultural-identification and self-determination is knowing and practising the values of our culture, such as the håfa adai spirit. Love your neighbor like he’s your che’lu. Respect people and their property like it’s your grandma’s own. Spread pås yan guinaiya (peace and love). “Liberation Day” was about two weeks ago, and if I saw you that day, I probably greeted you with “biba reoccupation!” Here’s why. I have mixed feelings about Liberation Day. On this holiday, we celebrate the liberation of our island from Japanese occupation thanks to the U.S. military with fiestas and a big parade in Hagatña. What I think we are forgetting to do and should be doing on this day is remember the suffering that our manåmko (elders) endured, commemorate the struggles that i taotao-ta (our people) overcame during the war, mourn the lives that were lost, and honor the people who lived through World War II. If you’ve been to the Liberation parade, it’s all about the military and thanking Uncle Sam for coming back for us. It was only 71 years ago, and we are already forgetting what happened. Truthfully, I don’t know everything that happened, but I probably know more about the World War II Era more than any other era in the history of Guåhan. 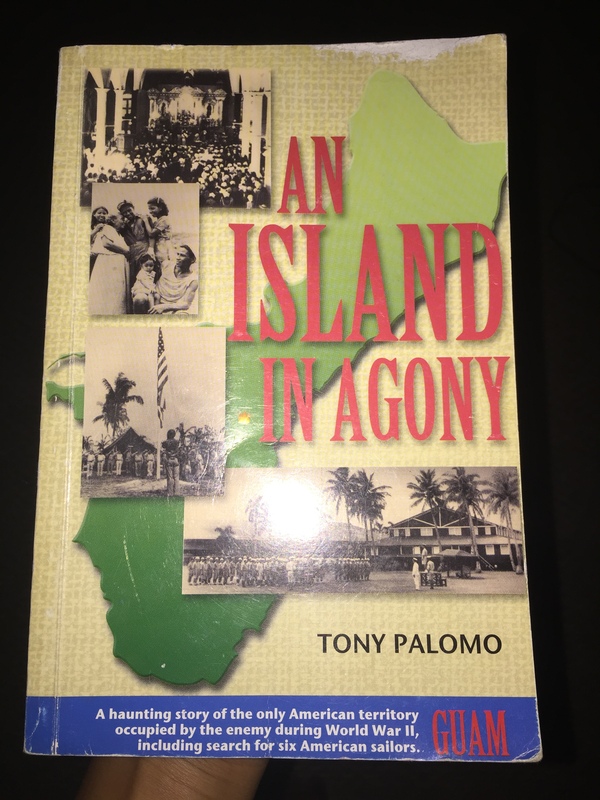 If your grandparents or great-grandparents aren’t with you anymore and unable to share their war experiences with you, I highly recommend that you read An Island In Agony by Tony Palomo. This book is a collection of written accounts of Chamoru war survivors and their experiences. I read it halfway, and had a hard time reading further because it was so wretched… This is what the book looks like, and you can probably find it in any book store. Liberation Day seems like a very joyful holiday on our island, but is it really? It seems like there’s more celebrating than commemorating, but what are we celebrating? Our people were very thankful for help of the U.S. military in World War II, as am I, but what they did with our thanks is quite controversial. The United States of America, the Land of the Free, has stripped us of 1/3 of our ancestral lands and denied us the right to govern ourselves all those years ago. They took advantage of our size and location, and took took took. People were forced out of their homes, their ranches, their farms, and were forced to live in poverty. They promised us American citizenship, and gave us the title, but not the rights. We can’t even vote for what happens to ourselves and our island. We are second-class citizens with no voice. For detailed information of all the injustices we suffered during and after WWII, there are books and many documentaries, one of them being War For Guam. DVDs will be released soon (I will keep you posted). There are many others, all eye-opening, stomach-wrenching, and haunting, which I strongly advise you to watch. You and I are colonized people and have been so for over 400 years. In fact, we are the longest colonized nation in the entire world. Che’lu-hu, WE ARE NOT FREE. So on July 21st, “Liberation Day”, I mourn. I’m angry. I don’t rejoice. Thanks for coming back Uncle Sam, but no thank you for your abuse, greed, colonization, and reoccupation. Please educate yourselves, get involved, be proactive, and free your minds. Remember, WE ARE NOT FREE.